If these small cartoon-like images look familiar to you, they should. These funny little images are called “emoji” (ee-mow-jee) – and recently they have been popping up everywhere – in text messages, social media, televisions ads, and on billboards. 74 percent of people in the U.S. regularly use emoji in their online communication, sending an average of 96 emoji per day, which adds up to a total of 6 billion emoticons flying around the world every day on mobile applications. What’s more, Instagram recently reported that nearly half of all text and comments posted on the platform contain at least one emoji. But what are emoji and why are they so popular? Emoji began in Japan and are defined as a mix of ideograms (an abstract thing or idea) and pictograms (an image that resembles the object it represents). The rise of emoji communication began with the advent of the emoji keyboard, which was released on the fifth version of Apple’s iPhone operating system. Emoji tap into human need to convey emotion. According to one study, emoji are doing what the tone of voice does on the telephone and what expressions and gestures do in face-to-face communication. Emoji are becoming so popular that brands have started to integrate them into their business and marketing practices. Domino’s Pizza’s recent advertising campaign promotes how the pizza giant now allows you to order pizza by texting the pizza emoji. Banks may be soon starting to use emoji to create more secure logins, according to Intelligent Environment, the company that is currently working on a new emoji security system. This system will allow users to create a 4-character passcode from a set of 44 emoji. The company claims their system is mathematically more secure because it allows for approximately 3.5 million combinations of non-repeating emoji, compared to just over 7,000 combinations of non-repeating numbers. According to Intelligent Environment, use of emoji passcodes might be easier to remember because images are a prime way of remembering. Bill Nye the Science Guy currently uses emoji to explain science concepts such as evolution. GE has just launched a new “Emoji Science” project, which includes a periodic table of emoji, where each “emoji element” represents a different Do It Yourself (DIY) science project. Even Sony Pictures Movie Studio is planning to get in on the trend by releasing a new movie based solely on emoji. The current buzz about emoji is not all positive however. Facebook recently removed its “feeling fat” emoji, after user backlash and a Change.org petition. A new petition to create a redhead emoji is underway because redheaded users say they are tired of being left out. It is also unclear whether people understand emoji meaning and use them appropriately. There is now a new Emojipedia to help people translate emoji meanings. However, emoji can still be confusing for many people, as Alex Goldmark and his girlfriend, Liza, discovered when they recently decided to only communicate via text with emoji for 30 days. They explained that there were instances where communication was misunderstood because of the use of emoji. The official meanings assigned to emoji is actually determined by the Unicode Consortium, which is responsible for the standard character encoding that makes it possible for us to see emoji across various web-enabled devices. The Unicode Consortium states that “while the artwork for each emoji varies by platform, the meaning of each symbol remains the same.“ However, while meaning is most often ascribed to the Japanese culture where they were first popularized, entirely new uses and meanings have subsequently been adopted. These include the “bunny girls” emoji which originally was used to show subservience but now is used to express girls having fun together; the “shooting star” emoji which was meant to mean dizziness but now denotes a shooting star; and finally, the “sassy” emoji which originally was meant as means of asking, “how might I help you?”, but is currently used to accompany a sassy statement. Increasingly, emoji are being used in health promotion campaigns. The Partnership for Drug-Free Kids, a national nonprofit dedicated to reducing substance abuse among adolescents, is leading the way with its newly launched #WeGotYou campaign targeted at teens. The campaign uses emoji to communicate the challenges of negative influences, empowering teens to resist these influences and live Above the Influence. Campaign ads feature emoji sentences and challenge teens to “crack the code” by visiting a mobile website. “Linguistically emojis were the perfect fit for our audience – emojis are today’s teen slang,” says Amanda Roberts of the Hill Holliday Advertising Agency that created the campaign. 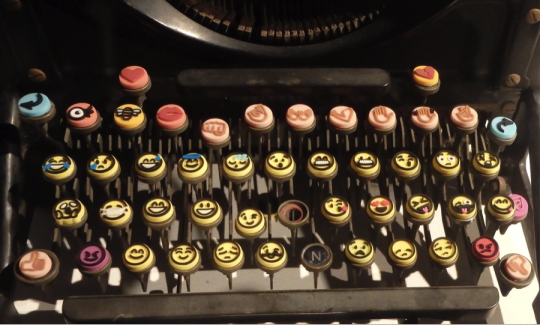 Emojiary is a new mental health application that combines users’ love of emoji with the act of journaling as a way to de-stress. This concept of using emoji to express emotions aligns with recent research that found that 72% of 18-25 year-olds admitted they found it easier to express their feelings through emoji rather than text. Health care company, Allergen, is currently tackling the issue of contraceptive adherence amongst 18-30 year old women with the use of emoji in their #ActuallySheCan campaign. “This is an unprecedented investment that Allergan is making in educating and informing millennial women, who are not really as engaged today as other generations were in their own healthcare and wellness,” explained an Allergan executive. The emergence of emoji as a popular form of communication creates new opportunities for public health professionals to reach and engage audiences in different ways. It allows for messages to be simplified so they can reach a variety of audiences in fun ways. As Emojinaylsis author, Dan Brill, suggests “people are connecting with each other more often because emoji makes it more fun.” However it is not without its risks. Meaning can be misconstrued and the difficulty encountered by some to “speak emoji” may ultimately create new forms of literacy barriers for important health messages. More research is needed in this area to identify the best ways to use emoji effectively to enhance health globally.